Below are listed the most amazing natural and man made landmarks of Australia. Natural landmarks are most impressive and surprising Australian monuments. Especially interesting are many unusual and unique biotopes and also unique cliff formations. Ball‘s Pyramid – near Lord Howe Island. Unusual remnant of volcano – 562 meters high and just 200 meters wide cliff rising directly from the sea. Tallest volcanic stack in the world. Up to recent time this was the only place in the world where the up to 15 cm long Lord Howe Island stick insect (Dryococelus australis Montrouzier) was living. Breadknife – New South Wales, Warrumbungle National Park. Highly unusual cliff formation – 90 meters high cliff blade, approximately half a kilometre long. Bungle Bungle Range – Western Australia, Purnululu National Park. Incomparable landscape created by highly unusual rock formations. Landscape is marked by up to 250 meters high sandstone pillars and beehive structures of contrasting light orange and dark colors. Deep gorges, labyrinths. Important site for investigation of sandstone karst processes. Devil’s Marbles (Karlu Karlu) – Northern Territory. Unusual location with rounded, giant granite boulders often standing in seemingly unstable positions. Kata Tjuta (Mount Olga) – Northern Territory. Unusual, impressive monolithic rock formation, consists of 36 steepsided domes up to 546 meters high. Sacred place to local Aborigene people. Endemic plants. Shell House – Western Australia, Kalbarri National Park. Beautiful and impressive coastal cliffs, Ordovician and Triassic sandstone and shale. The Twelve Apostles – Victoria. Group of closely located, some 50 meters high limestone stacks standing in the sea. Popular tourist attraction due to good location next to the scenic Great Ocean Road. 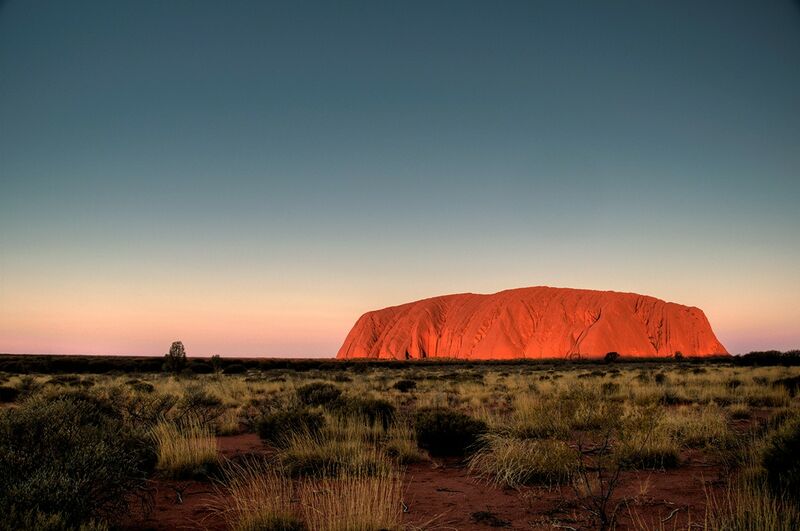 Uluru (Ayers Rock) – Northern Territory. One of Australian symbols, enormous and visually very impressive sandstone inselberg, 348 meters high and 9.4 km in circumference. Sacred place to local Aborigene peoples, contains many springs, waterholes, caves and rock art sites. Endemic plants. Wave Rock – Western Australia. Highly unusual cliff formation which resembles enormous petrified wave. Several more such formations in vicinity. Dalhousie Springs – South Australia, Witjira National Park. A group of up to 60 powerful thermal springs at the fringe of desert, these 38 – 43 degrees C springs discharged around 23,000 l/s a century ago if added together; now the discharge only around 17,000 l/s. Contains numerous endemic species. Elizabeth Springs – Queensland. Remote springs in arid region, where over the last 1.8 million years has developed a unique ecosystem with endemic species, such as a fish – Elizabeth Springs goby (Chlamydogobius micropterus Larson), snail etc. 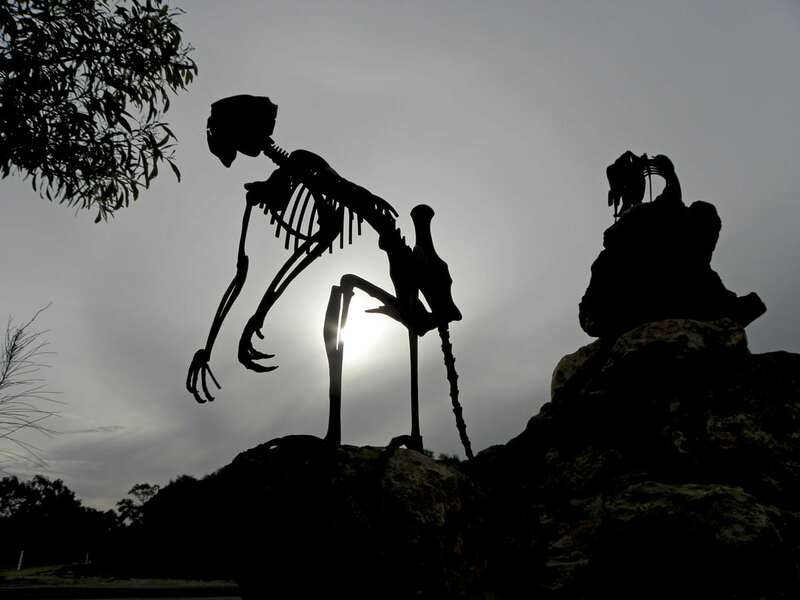 Dinosaur Stampede – Queensland, Lark Quarry. Almost 4,000 dinosaur footprints over area of 210 square meters, some 95 million years old. Ediacara Fossil Site – South Australia. Find of fossils of global importance – contains unique fossils of extremely ancient soft-bodied animals who lived 630 – 542 million years ago. Geological period named after the site – Ediacaran Period. Naracoorte Caves – South Australia. Cave contains remnants of 99 species of mammals plus remnants of other kinds of animals. Exceptionally well preserved remains of extinct animals range in size from small frogs to extinct giant marsupials. Riversleigh – Queensland, Boodjamulla (Lawn Hill) National Park. Outstanding fossil site. Fosilized remains of very unusual animals have been discovered here such as marsupial lions Wakaleo, 3 meters high birds Dromornis, giant platypus Obdurodon, tree-dwelling-crocodiles Mekosuchus and up to 6 meters long snakes Wonambi. Riversleigh lies within the traditional country of the Waanyi Aboriginal people. Yea Flora Fossil Site – Victoria. Site with 415 million year old fossils of ancient vascular land plants Baragwanathia, oldest of its kind in the world. The Daintree Rainforest – Queensland. 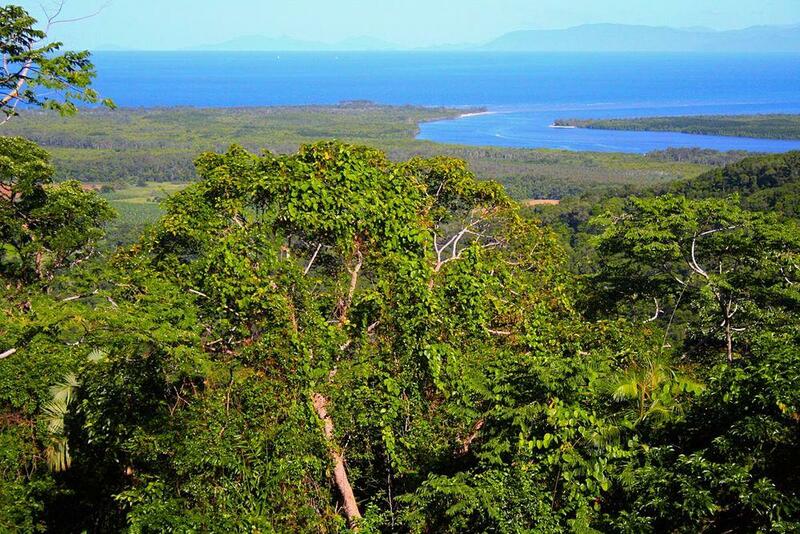 Possibly the oldest rainforest in the world, growing 135 million years. Largest continuous rainforest in Australia, 1,200 square kilometers large, extremely high biodiversity. Contains unique, endemic primitive flowering plants. Fraser Island – Queensland. Largest sand island in the world, 1,840 square kilometers. Contains dunes up to 24 meters high, tall rainforest growing at elevations up to 200 meters, unique ‘vallum’ heaths and more than 100 unique, crystal clear dune lakes retained in the sand by organic matter deposits. Hamelin Pool and L’haridon Bight – Western Australia, Shark Bay. Hypersaline shallows with unique biotope – active growth of stromatolites – oldest known form of life on Earth. Also other unique forms of life. Lord Howe Island – this remote, 56 square kilometers large island has its own ecoregion where half of plants and some birds and other animals are endemic. Unique characteristics is diverse glowing mushrooms in the forest, some bright enough to be used for reading in night. Endemic kentia palms are popular beautiful houseplants. Palm Valley – Northern Territory, near Alice Springs. Oasis in the middle of enormous desert, the only place in the central part of Australia where grow palms: the rare Livistona mariae as well as other rare plants. Ecosystem is fed by spring water. It is likely that palms were brought here by people some 15 – 30 thousand years ago. Tree heath south of Freycinet Estuary – Western Australia, Shark Bay. Unique biotope with at least 51 endemic species. Wollemi pine stands – New South Wales, Greater Blue Mountains. The three only existing populations of Wollemia nobilis pine in deep, inaccessible gorges with less than 100 Wollemi pines remaining. This tree was thought to be extinct 150 million years ago until it was discovered not far from Sydney in 1994. Wooramel Seagrass Bank – Western Australia, Shark Bay. Largest seagrass grove in the world, covers 1,030 square kilometers. Australian Oak in Reynolds Falls – Tasmania. Largest Australian oak (Eucalyptus obliqua L’Hér.). Diameter 6.62 m (girth 20.50 m), height 61 m, volume 341 m3. 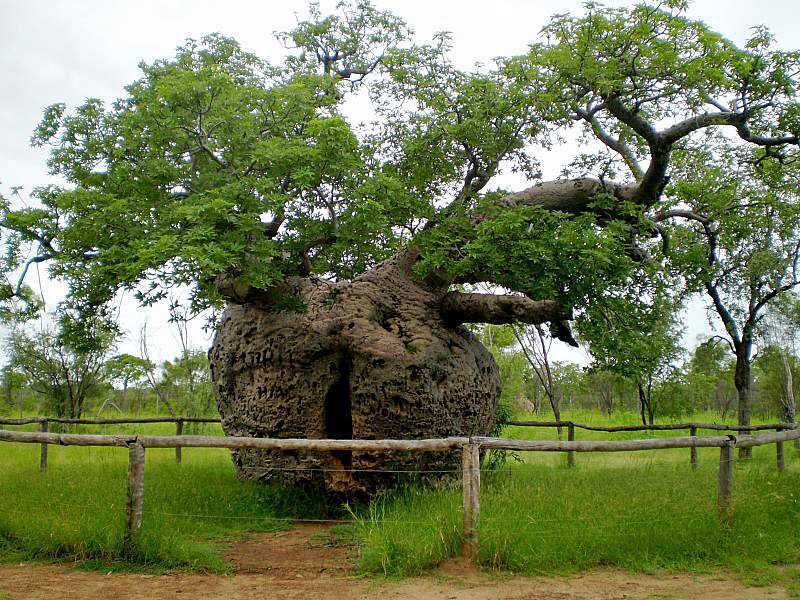 Giant Tingle Tree ("Hollow trunk") – Western Australia. Stoutest red tingle (Eucalyptus jacksonii), girth 22.3 m, 30 m high. Centurion – Tasmania. Highest known mountain ash and eucalypt (Eucalyptus regnans F.Muell.) in the world, making this the second tallest tree species in the world. Height 99.8 m, diameter 4.05 m (girth 13.7 m), volume 268 m3. Has been at least 103 m tall but the top is broken. Huon pine growth of Mount Read – Tasmania. Growth of genetically identical Huon pines (Lagarostrobos franklinii (Hook.f.) Quinn), stand of trees is 10,500 years old although none of the individual trees is that old. Rullah Longatyle (Strong Girl) – Tasmania. The largest eucalypt and largest Tasmanian blue gum (Eucalyptus globulus Labill.) in the world. Volume 368 m3. Height 82.3 m, diameter 5.54 m.
The Boab Prison Tree – Western Australia. Unusual boab (Adansonia gregorii F.Muell. ), circumference 14.64 m, height just 9.5 m. Used to lock up indigenous Australians in 1860s on their way to sentencing. Eaglehawk Neck tesselated pavement – Tasmania. Extreme, visually impressive example of tesselated pavement which looks like an exact pavement of large bricks. Jenolan Caves – New South Wales. Possibly the oldest caves in the world – it is determined that the clay sediment of the caves is approximately 340 million years old. 10 caves opened for tourism. Kiama Blowhole – New South Wales. One of the most popular blowholes – location where sea waves through the passage in the cliffs create water spray which is up to 25 meters high. 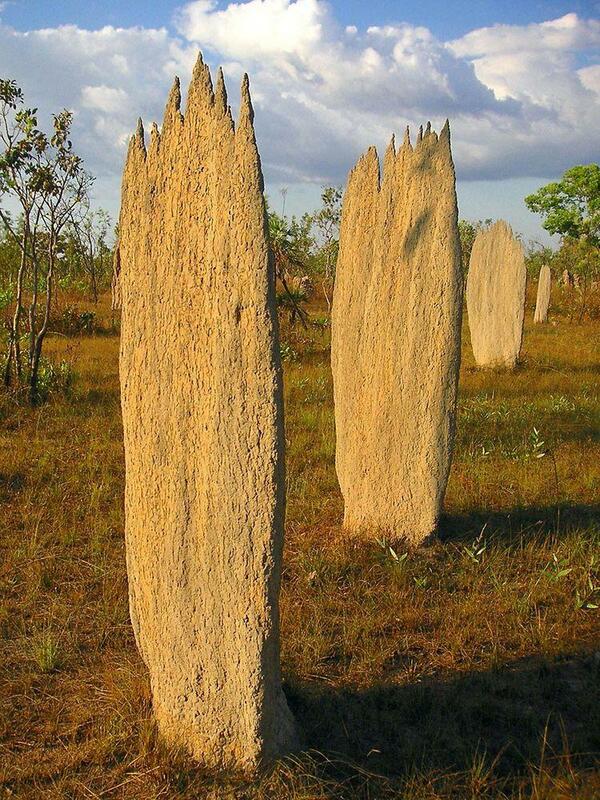 Magnetic termite mounds – Northern Territory, Litchfield National Park. Unique landscape formed by multiple flat termite mound formations oriented in north-south direction in order to control the temperature inside the mounds. Morning Glory of Carpentaria Gulf – Queensland and Northern Territory. Unique phenomenon, characteristic for region at the southern part of Carpentaria Gulf. Here in September – November early in the morning often form up to 1000 km long roll clouds, providing unique sight. Wallaman Falls – Queensland. The highest permanent waterfall in Australia, with 268 meters high single drop. Total height with minor drops – 340 meters high. Wolfe Creek crater – Western Australia. Visually expressive meteorite impact crater, 875 meters in diameter, 60 meters deep. Created some 300,000 years ago. The fascinating Australian archaeological heritage is untypical if compared with the rest of the world. Where other ancient cultures expressed themselves mainly through building of defensive structures, structures for their nobility and religious complexes of gargantuan size, Australian Aborigene people have expressed themselves through unique art – paintings and stone carvings and whole Australia is dotted with these paintings. Much of the archaeological heritage in Australia is on the border between the past and the present – Aboriginal cultures which created these monuments, still exist and many monuments still are revered by them. There are several hundred thousand sites with the rock art in the country, mostly in the northern part, but in other parts of the country as well, including even the suburbs of Sydney. Oldest rock art is 39,000 years old, while in many sites new art still is created, also the existing artwork often is repainted by Aborigene people (as it is done for the mythological Wandjina art). Imagery is very diverse – starting from simple cup marks and cupules and ending with elaborate and highly original monuments of art copied and used in luxurious interiors around the whole world. There are multiple styles of art, including very distinct and highly developed art styles created tens of thousands of years ago. Just a few locations of Aboriginal rock art are disclosed to the general public and numerous sites, which are sacred to Aborigene people up to this day, are off-limits to other people. It is much better to know that something extremely valuable exists and is hidden from most eyes, than to learn that it has been destroyed by some vandals. Billimina – Victoria, Grampians National Park. Impressive giant boulder covered with more than 2,500 cliff drawings. Kalumburu Gwion Gwion – northern tip of Western Australia. Excellent samples of Gwion Gwion (Bradshaw) style – sophisticated silhouettes of humans and other beings, often mythical ones. At least 17,000 years old. Koonalda Cave – South Australia, Nullarbor Plain. A cave richly decorated with approximately 20,000 years old drawings over area of thousands of square meters. Part of the cave flooded as the sea level rose. Ku-ring-gai rock engravings – New South Wales, Ku-ring-gai Chase National Park. Diverse rock engravings in comparatively soft sandstone, including engravings of Emu constellation showing interpretation of star constellation in the sky. Murujuga cliff art – Western Australia, Dampier archipelago. Over one million diverse petroglyphs, often showing also extinct animals such as the Tasmanian tiger (Thylacinus cynocephalus Harris). Largest collection of cliff art in Australia. Ngamadjidj shelter (Cave of Ghosts) – Victoria, Grampians National Park. Ancient shelter with ghostly white drawings created with clay. White color is associated with death and the spirit world. Nourlangie Rock (Nawurlandja) – Northern Australia, Kakadu National Park. Impressive cliff with numerous ancient shelters. Some, such as Anbangbang and Nangawulurr contain impressive paintings of mythological nature. Red Hands Cave – New South Wales, Blue Mountains National Park. Contains numerous 1,600 – 500 years old hand prints and stencils. There are numerous sites with such hand stencils in Australia. Ubirr (Obiri) – Northern Australia, Kakadu National Park. 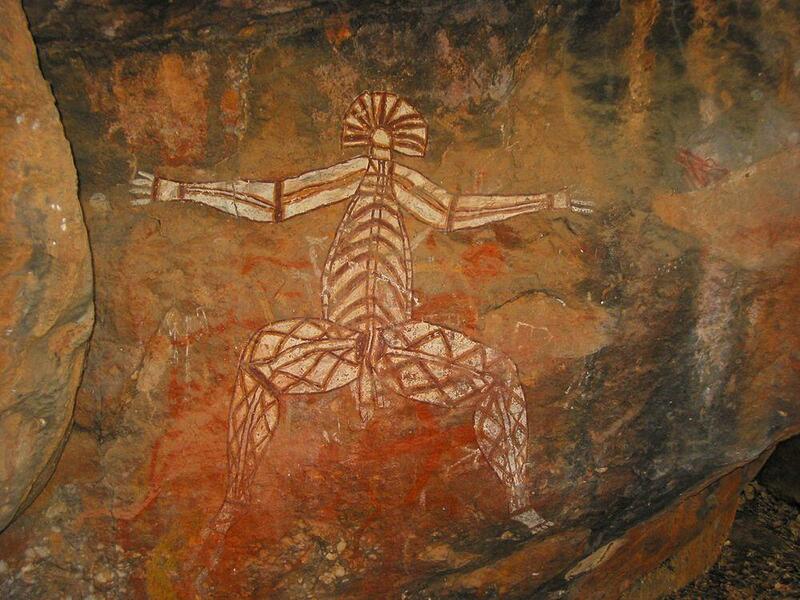 Some of the best galleries of Aboriginal X-ray style drawings, some are up to 40,000 years old. Three galleries are accessible to visitors. Walga Rock art – Western Australia, south-west from Cue. Cave with extensive cliff art galleries, including a drawing of an European sailing ship (contact art), most likely from the late 19th century. Such contact art is met in several locations of Australia. Wonalirri Wandjina paintings – Western Australia. 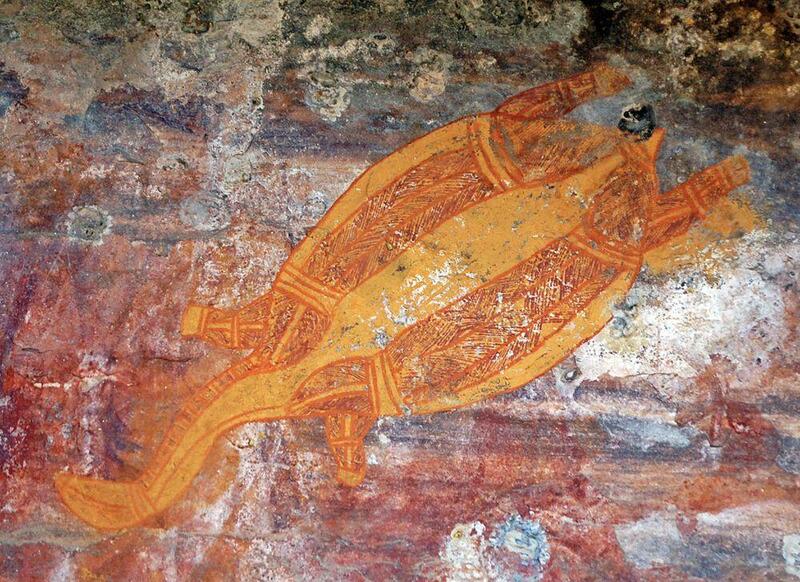 Rock shelter with very interesting Wandjina paintings of high artistic value. Goold Island fish trap – Queensland. Impressive and complex system of stone settings serving as a trap for marine animals – fish, turtles, dugongs. Such stone settings are common along the coast of Queensland. Murujuga stone arrangements – Western Australia, Dampier archipelago. Diverse stone settings including tall menhirs, circular stone settings. Wurdi Youang stone arrangament – Victoria. Here some 100 stones are arranged in an egg-shaped form about 50 meters across. Yam (Iama) island stone settings – Queensland, Torres Strait. Stone lined drainage systems, pathways and calms, linked to agriculture systems. Mungo Lady – New South Wales, Mungo Lake. Find of the oldest cremated human remains in the world. Contrary to the name it seems that here rests a male, who was cremated and sprinkled with red ocher some 40,000 years ago. Ngarrabullagan Cave – Queensland. The oldest known human settlement in Queensland, over 37,000 years old. Cave floor has 27 layers of habitation. Samford Bora rings – Queensland. Some of the best preserved earthen rings – unique ritual structures for male initiation ceremonies. In total in the eastern part of Australia there are some 426 such structures. Tully River dendroglyphs – Queensland. Seven carved trees with diverse designs. Dendroglyphs are characteristic monuments of Aboriginal culture, characteristic in the New South Wales and also neighboring regions. Weipa shell mounds – Queensland, west coast of Cape York Peninsula. Some 600 human built mounds of shellfish Anadara granosa, including ridges which are several hundred meters long and up to 13 meters high, up to 1,200 years old. Origin and purpose of these structures is not completely clear. One of the iconic buildings representing not only Australia but the 20th century architecture in general is the building of Sydney Opera House (New South Wales), built in 1973. Cityscape of Sydney is adorned also with the renowned, 139 meters high arch of Sydney Harbour Bridge (New South Wales), built in 1932. Important testimony to the Australian history is Port Arthur (Tasmania) – former convict settlement for hardest British and Irish criminals. This site is renowned also as a haunted place. Coober Pedy (South Australia) is an unusual settlement of opal miners, where many people live underground due to the scorching heat above the ground. Here under the ground has been built also churches, hotels and other buildings. Major part of the landmarks of Australia are natural monuments but of world importance are also such archaeological monuments as Australian cliff paintings and some architecture monuments, e.g. Sydney Opera House. Australia is divided into six states, three mainland territories and several external territories. From this list is excluded Australian Antarctic Territory. All monuments of this territory can be found through the description of Antarctic and Sub-antarctic region. Norfolk Island is somewhat separate, self-governing territory, still being a part of Australia. Macquarie Island is part of Tasmania, but here it is reviewed separately because it is located far from Tasmania. 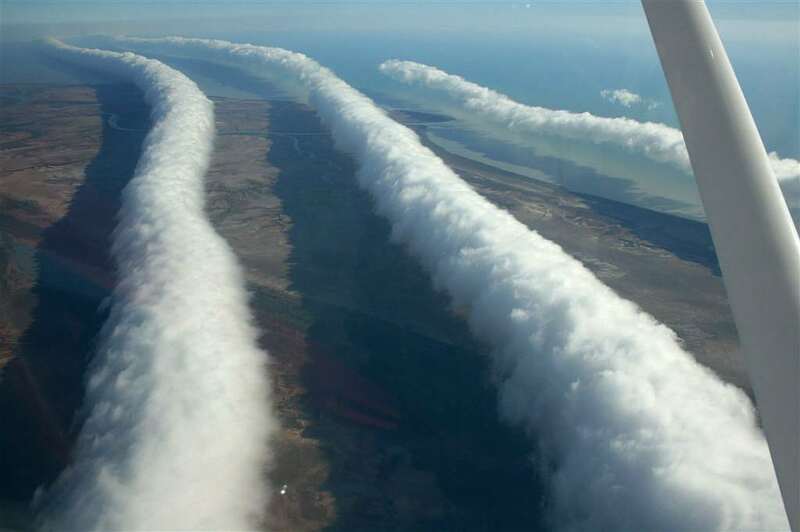 To the south from the Carpentaria Gulf there is seen extremely unusual weather phenomenon – Morning Glory of Carpentaria Gulf. It happens (and rather often), that early in the morning above the surprised spectators "roll" over one or few roll clouds – long, low, narrow clouds resembling giant, up to 1,000 km long ropes. Elsewhere in the world this is very rare phenomenon but here it is frequent. This is the only place on Earth where this beautiful natural phenomenon can be predicted. This is the first book-length study of the archaeology of Australia’s deserts, one of the world’s major habitats and the largest block of drylands in the southern hemisphere. Over the last few decades, a wealth of new environmental and archaeological data about this fascinating region has become available. Drawing on a wide range of sources, The Archaeology of Australia’s Deserts explores the late Pleistocene settlement of Australia’s deserts, the formation of distinctive desert societies, and the origins and development of the hunter-gatherer societies documented in the classic nineteenth-century ethnographies of Spencer and Gillen.